Red spider mite, of the genus Tetranychus urticae, are sap feeders. 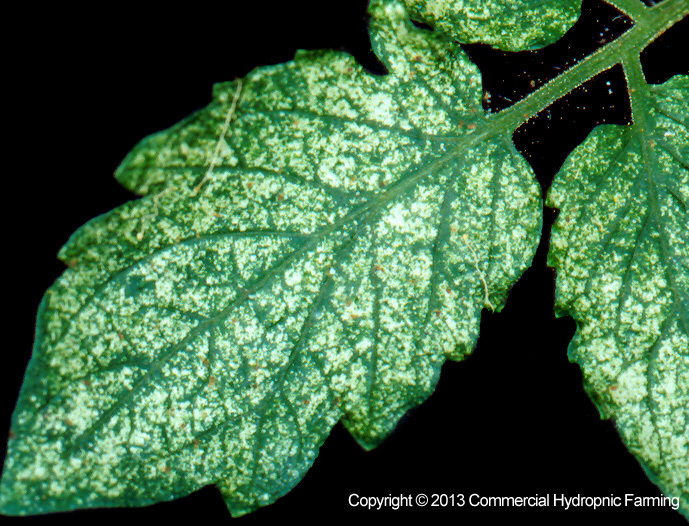 Although there are several species of spider mites which attack plants, the red spider mite and the two-spotted spider mite are the most common. The red spider mite is often referred to as the “red spider”, the “red mite”, or the “red spider mite”. In periods of hot dry weather the leaves of host plants become blotched with pale yellow, reddish-brown spots ranging from small to large areas on both upper and lower leaf surfaces. The leaves become pale and sickly in appearance, gradually die, and drop off the plant. Before death the leaves look as though they have been dusted with some sort of powder which is caused by numerous skins of the mites coupled with a depletion of leaf chlorophyll. The spider mites in general are about 0.5mm long. They may be whitish, green or red, depending upon the species. The most common types found on tomatoes in South Africa are red. The mites are eight-legged (the insects have six legs) and are close relatives to spiders rather than insects. The spider mites live on the sap of the plant which is drawn by piercing the leaf with two sharp, slender lances attached to the mouth. The mites attack many types of vegetables and field crops. The mites spin webs as do spiders, and are able to be blown from field to field by floating or parachuting in the wind on their webs. The first outbreak of mites in a field generally occurs around barns, fences, trees or some obstacle in the field. The mites are also severe pests of plants grown inside or in greenhouses. Control can be difficult since care must be taken to select the correct pesticide and thoroughly cover the plants especially under the leaves where they are found. It is good practice to apply second application five to seven days following the first, in order ensure effective control and prevent resistance to build-up. The reason for this is that the first application kills the nymphs and adults, but the eggs are not killed by most pesticides. If more than five to seven days are allowed to pass after the first application, the existing eggs will have time to hatch, and the females will have matured and laid eggs again. Therefore, a second spray kills the nymphs before they reach maturity and lay eggs which in turn would provide for a new generation. Red spider mites can be controlled biologically with Phytoseiulus presimilis and Amblyseius sp.